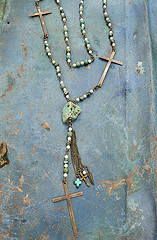 Debi Mattingly’s jewelry caught my eye immediately when I received photos from her publicist. Designing since the early 1990s, Debi is inspired by family and her childhood living in Louisiana. Her work is quietly unique and a big hit with the Los Angeles crowd including Demi Lovato, Laura Vandervoort, and Ellen Hollman. I started out as a professional mixed media artist in the early 80’s with my own gallery, but a lot of my customers would see jewelry I was wearing and ask about it. After ten years as a successful artist, I decided to design & create wearable art. I was “discovered” by the film/television industry, through friends of mine that were screen writers and costume designers, that exposed my work to the industry; so I started my own jewelry line in the early 90’s that was inspired by my cultures (Cajun/Creole and Muskogee Creek Indian). I received my trademark, debi lynn designs, in 1994. All of my work is made here in Houston, TX. I have been blessed to have two studios – one as my showroom/studio, Yaya Chique, and my manufacturing studio where my employees help to make the orders for wholesale and/or limited editions. I make all my one-of-a-kinds in my private studio. How does your ethnic background influence your designs? Now my father’s side of the family is Muskogee Creek Indian from Alabama. I would visit my Granny all the time and play for hours along the riverbanks and creeks of the Alabama River. Along with our spiritual traditions, I was taught how to bead, weave, and make jewelry and clothing that was worn traditionally by my ancestors. As a designer I have been blessed to have grown up with beautiful and spiritual cultures, and they greatly influence my work and creative process. I develop a new line of jewelry 3 times a year using the same main materials: leather, old beads, old stones, vintage fabrics and metals. I never do a sketch on paper – I see it in my head. I know what I want a piece to look like, but then sometimes it takes a while to get the technique right. Making sure it will lie correctly, won’t scratch, won’t fall apart, and mainly will last a lifetime. Sometimes a design can take months to develop and get it just right and other times it comes together in under an hour. I just never know where the materials will lead me. My customer is female, 28 to 42 years of age although I do have a lot of customers from my age group – the original hippie! I am getting more men wanting my work now, especially the rock ‘n roller. The debi lynn customer feels comfortable with who they are and always wants something different that not everyone else has. I aim to create something unique that doesn’t cost a fortune! How do you think your distinctive style works with other styles? When I design a piece of jewelry, I make sure that I am aware of the fashions for the upcoming season, especially the color palette. 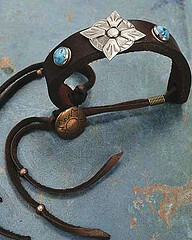 When I get ready to design for the next season, I research to see what new movies/TV series are set to come out for the following year and I can pretty much guarantee that customers are going to want similar styles in their jewelry. I also watch the Country & Rock ‘n Roll music industry to see what new and upcoming singers/bands are getting some popularity. I watch to see what their style is. As a jewelry designer, I want to make sure I am not taking away from or fighting with the current fashions but that I am complementing the new looks. By doing this, my designs can go from the red carpet to street style all in the same moment. Who is your creative hero & why? Who else, but Ralph Lauren! He is definitely a Master Designer in all things. It still amazes me to this day how he can reinvent himself every season and only get better. I always ask myself, “What would Ralph do?” And this is with everything from designing to running a business. I am finishing up the fall line for this year and will also be doing a Holiday & Resort line. 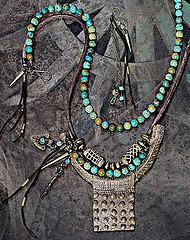 For the H&R designs I am going to be using antique Afghanistan jewelry that I have had for about eight years, and the proceeds of the sales will be going to the “Women for Women Organization” (http://www.womenforwomen.org) to specifically help the women in Afghanistan. I am also working on my designs for next spring. I LOVE the color palettes and fashions for next year! What is your favorite go-to piece of jewelry and why? I wear all of my own jewelry and sometimes I mix it with some vintage pieces I love to collect. As a designer, I won’t create or sell it unless I am willing to wear it myself and same goes with my clothing. In fact, since I create my own clothing my customers have been asking me to design a line of clothes. Maybe someday, who knows where my journey will lead me? Well heck, Debi, I knew we were on the same style page. I’m a big fan of Ralph as well. I really like his consistent references to the 1920s. Thanks so much for taking time to share your story and jewelry with Over Dressed for Life.